What did any of us do before there were probiotics? Wait, don't answer that. I know. We suffered in silence. When it comes to stomach pain, bloating, and digestion problems, we owe medical science a big, fat thank you. There have been many discoveries over the last decade plus about the benefits of overall gut health, not to mention the havoc that a round of antibiotics wreaks on our systems. Our intestinal health is a complex problem. And probiotics have come to the rescue. It have even recently been proven to prevent sepsis in newborns. There are many brands available, and Nature's Bounty is one of the best, producing a very high quality line of probiotic products. If you're looking to maintain the health of your digestive tract, keep your natural gut flora in balance, and alleviate any bloating or digestion problems you might be experiencing, adding it to your diet will help. 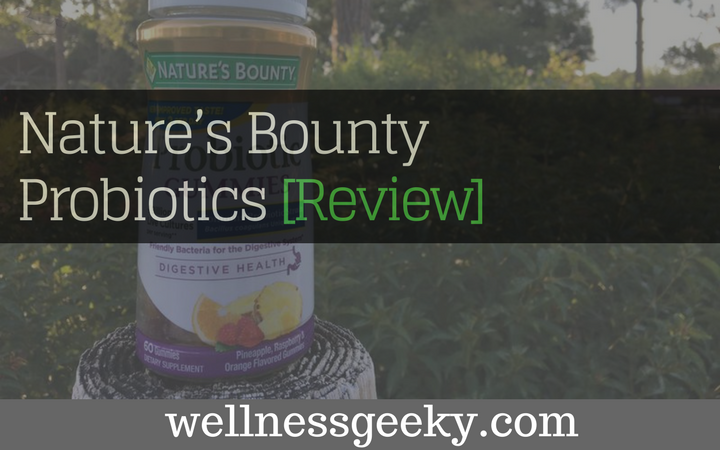 We reviewed the line of Nature's Bounty probiotics and have outlined which are best for various conditions. Probiotic 10 is best for keeping your digestive system in balance and maintaining healthy functioning of your immune system. They are made up of live cultures and probiotic strains. The number and type of each is what differentiates them from one another, and hence why some work better for certain conditions and ailments. Probiotic 10 comes in a jar of 60 capsules. Each contains ten strains that support your digestive health and 20 billion live cultures. In addition to the organisms in the cultures keeping your digestive system in balance, they maintain the health of the flora in the intestines and can help better absorb nutrients. The live culture number reflects the number at the time of packaging, so you should keep the jar in the refrigerator to keep the cultures alive. Opinions are mostly positive. The vast majority of people who buy and use this product suffer from digestion problems and most claim a cessation or at least lessening of their cramps and digestive issues within a week. There is scant evidence as to whether or not the immune system is directly benefitting from Probiotic 10, though many agree that they feel better overall. And other still claim to have more energy. Because it is scientifically difficult to tie a direct correlation between supplements and immune system health, this is a hard one to quantify. Based on overall reviews, however, the vast majority claim to notice an overall improvement in health and energy level. They are good for diarrhea, especially traveler’s, or occasional diarrhea. Helps with cramps that are often associated with poor digestion. They have to be refrigerated. The recommended dosage is one a day, which is more than an average healthy person really needs. If you are suffering from severe digestion problems, bloating, or cramping, you might try one a day until your symptoms subside. After that, you can try to taper to a few or one a week to see if the balance is maintained in your system. Overdoing it can have adverse effects. The very symptoms you are trying to curtail--bloating, gas, diarrhea, and cramping can result if you take too much or too many. It depends on your overall health and symptoms, but tailor the amount you take accordingly if you are in distress. As noted in the Cons section, if you are suffering from serious digestion problems or taking antibiotics, take the recommended capsule a day. Once you start to feel better, if you maintain the dosage and feel fine, you can stay the course. If you start to have adverse reactions, try cutting back to see if that helps. Another possible side effect is no reaction at all. Often times people experience no improvement or decline in their symptoms when they take it. Because every system is different, and every probiotic is different, if you don't get better, ensure you're taking the correct strains and cultures designed to target your specific symptoms. This choice is best for those looking to maintain the overall health, wellness, and balance of the digestive system. Acidophilus comes in two varieties: 100 chewable wafers or 150 tablets. They contain 100 million organisms of Lactobacillus Acidophilus, which is friendly and supportive for digestion. This is not the right option if you are in distress or suffering from an acute digestive problem. This is for maintaining healthy flora and balance. Most opinions are positive on this particular brand and product. Reviewers claim improvement in overall digestion and stomach health. Some claim that they experienced no difference at all, better or worse. This can be a common side effect because everyone's bodies react differently. There are millions of strains of natural bacteria in our guts and digestive tracts, so sometimes it can be hard to find the exact right strain that will work for you. The majority of reviewer's like the price, value, and effectiveness. The tablets are flavorless, small, and easy to swallow. The price is low compared to other brands, making these more affordable as a daily supplement. Good value for the number of live organisms you get in each tablet. Competitive products are more expensive or contain fewer. Gluten free, wheat free, and lactose free. Refrigeration after opening is required. Is not effective for relieving heartburn. While rare, in some cases, people developed diarrhea after using this product. As with any probiotic, it's a good idea to ensure you have the right strain for what you are looking to treat. Read the labels carefully. This is for maintaining healthy digestion, not for treating a condition. These are also best for maintaining overall digestive health. It's just a better option if you don't like taking pills, capsules, or eating wafers. Anything that's good for you and delivered in a gummy form is all right by me! These taste great and come in three flavors: orange, raspberry, and pineapple. They contain friendly bacteria that is good for digestion and you get four billion live cultures per serving, which is four gummies a day. Overall positive reviews on the gummies, as they target a very specific preference. These are not for treating serious conditions, so those who tend to purchase supplements in gummy form are generally going for maintenance in an easy-to-take format. The gummies fit the bill. A small percentage of reviewers don't like the taste, but they are far outweighed by those who do. Fruit flavors are a preference, and you generally see that pattern. The main negative review that you will find is that the labelling is misleading. You need to take four gummies a day, not two as suggested, if you want the requisite number of live strains daily. Taste. If you are a chocolate lover, these might not be in your wheelhouse. But if you like Dots, these fruit flavored gummies will satisfy. And when they contain healthy probiotics, even better. Good general probiotic for maintaining digestive health. Misleading dosage labelling. You have to take four a day to get the daily recommended amount, so the label is misleading, as it indicates you only need take two a day. Not strong enough. If you have more severe digestive issues, you should consider taking a capsule or stronger strain. These aren’t advertised as treating acute or chronic stomach or intestinal pain, so read the packaging carefully. While fairly rare, some users experience gas, bloating, stomach pain, diarrhea, and cramps. All of them can produce counterproductive side effects, so it's important to monitor your dosage and start slow to ensure your system can handle the organisms. Probiotic GX is best for those who suffer from occasional gas and bloating and the resulting abdominal pain and discomfort that accompanies them. The specific patented strain is one studied by gastroenterologists, and in each capsule you get 20 billion live cultures. This is formulated with an enzyme that contains three ingredients that specially target better functioning of the intestines and relieving abdominal pain and bloating. Reviews are in the upper ninetieth percentile positive when it comes to GX. Because this is a very targeted formulation, with clear indications and labeling, those who purchase it for their specific symptoms find relief. What you overwhelming hear is that this is a lifesaver, it works great, and that users have had great success with treating their gas and bloating. The few negatives that you will find have a similar refrain, which is either no results or stomach pain. These are fairly common and are due to statistical significance. Overall, the reviews are overwhelmingly positive for GX. Cost. These are getting up there in price range comparatively because they come in a jar of 25 capsules for about the price of a more generic, non-targeted probiotic that comes in a jar of 100. That’s not an apples-to-apples comparison, however, so you have to take that into consideration. Different strains and amounts vary wildly when it comes to price. The side effects reported are common across all strains, brands, and types. You typically hear that either no results were experienced or that symptoms were worsened. These are very rare, but do occur in some circumstances. Make sure you suffer from gas and bloating before you take this product. If you're looking for overall digestive health, you should consider acidophilus or another strain that is not meant for these symptoms. Containing 2 billion live cultures and 6 probiotic organisms, these are best for those looking to maintain the health of the digestive and intestinal tracts as well as immune system. One jar contains 30 caplets, and you take one a day with or without food. These work on a delayed release system, which is ideal for ensuring you get it into your system gradually throughout the day as opposed to all at once. Reviews for CD are predominantly very positive. Commonalities are the time release and cost. The time release formula seems to help those who suffer from intestinal health issues such as Irritable Bowel Syndrome. And because you get 2 billion strains per dose, it could be a bit much for your system to handle at one time. The cost in relation to number of organisms and strains is very good comparatively. The probiotic strain is general in nature and less likely to produce gas or other side effects. These contain milk, so if you’re lactose intolerant or sensitive to dairy, steer clear. Caplets can be hard for some to swallow. As with all probiotics, while rare, some people experience gas, bloating, cramps, and diarrhea. If you're looking to improve the health of your intestinal tract, natural flora, or improve digestive issues, probiotics can help with those and myriad other symptoms and ailments. And when it comes time to purchase, Nature's Bounty is a good choice. Most of their products are priced well compared to other brands, but some are on the expensive side, so choose carefully. As with all probiotics, some side effects like stomach pain and diarrhea can occur, though it isn't common. Make sure you read the labels carefully and buy the type that corresponds to your symptoms and goals.